This is an alternate view of this depot, take from the other side. I had to walk around a fence to get here. 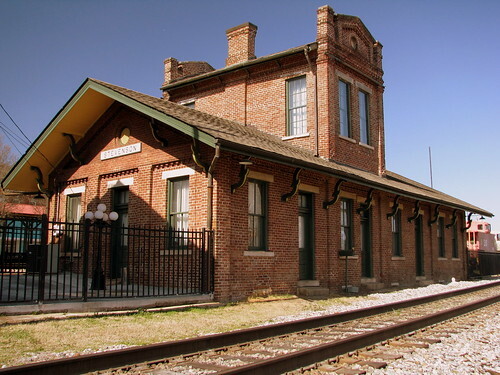 One of the older and busier train stations in the area, this historic depot was built in 1872 and has active train tracks on either side. Originally, a one story depot was constructed here in 1853 when tracks first came into town. When that building burned, it was replaced by this brick one in 1872. During the Civil War, Stevenson was a hub of activity. Troops skirmished here and the town changed sides several times, although it was mostly under Union control. Troops occupied the town and a large refugee camp sprang up between here and Ft. Harker a quarter mile away. Tens of thousands of soldiers, horses, wagons, prisoners of war, refugees, wounded and others passed through the city during the summer and fall of 1863 around the time of the Battles of Chattanooga and Chickamauga. Harpers Weekly noting the juncture of East-West and North-South rail lines here called Steveson one of the seven most important cities of the South. After the war, the Dept and the brick hotel built next door, also between the tracks continued as the center of life in Stevenson. Trains stopped here at mealtimes and passengers are in the hotel dining rooms. Other passengers spent the night here. It was said that the hotel is so close to the tracks that the trains opened the hotel windows and pulled the covers off the beds. 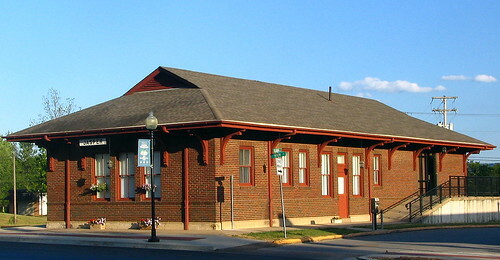 The Depot and Hotel were added to the National Register of Historic Places in 1974. However, the depot still needed to be saved. A group of citizens save the depot from deconstruction during the 1976 bicentennial when the last railroad office closed. In June of 1982, a community museum opened here after renovation. seen along (OLD) US70 when entering the old business district from the east side. Inside the D is a steam locomotive to focus on the town's railroad heritage. I am not certain about the significance of the military in the IC or the church in the K. The S is the Renaissance Center. O is a golf course. N is the county courthouse in Charlotte. 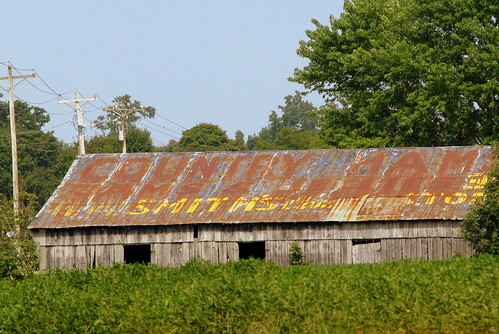 While the roof of this barn hasn't been painted in years, I believe whatever it used to advertise has now become Dennison's Roadside Market, which is about 3 miles up the road (Highway 31E) in Barren County, KY north of Glasgow. Even tougher to read is the side of this barn which is a very faded ad for Mail Pouch Tobacco. On the far left, I can easily make out the word Chew. With as many cabooses I've seen over the years, and as many CSX trains I've seen over the years, it occurred to me as I was photographing this one on the other side of the tracks that I'd never seen a CSX caboose before. It makes sense, I suppose. 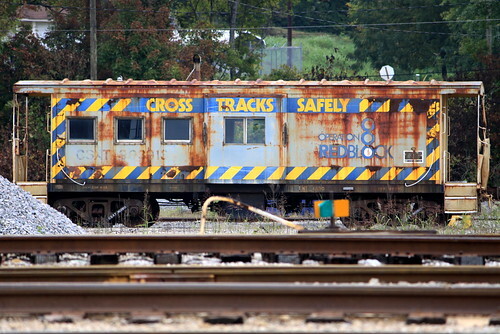 The need for cabooses had already diminished by the time CSX was formed in 1986, but it makes you wonder how many of them are out there. 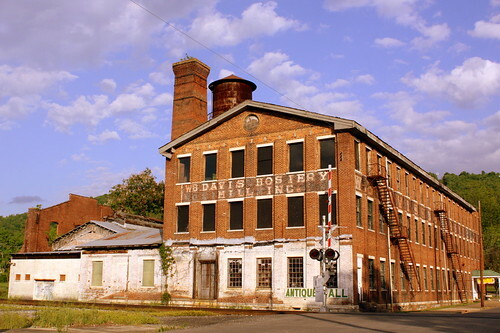 This building was erected in 1889 to be the Alabama Builders' Hardware Manufacturing Company to produce an extensive line of tools. However, Industry in Ft. Payne reached an economic downturn soon thereafter and this building became unused. In 1907, the doors reopened and the Florence Knitting Company and became a major knitter of socks. In 1915, W.B. 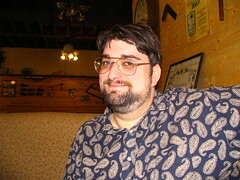 Davis became the majority shareholder and the company was booming. Fort Payne became the largest single location of hosiery manufacturing in the United States and the city soon earned the nickname "Sock Capital of the World." 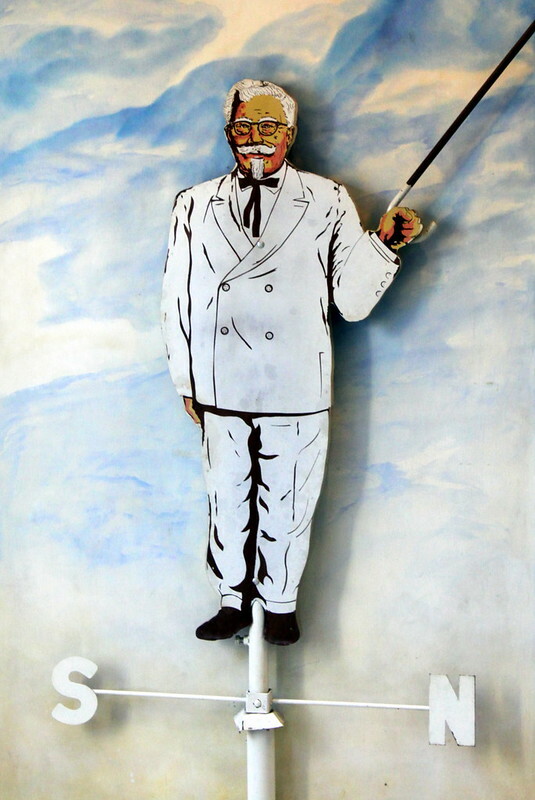 Perhaps I should have titled this "You're So Vain You've Made Yourself into a Vane"
This is one of the many wonderful things on display inside of the first Kentucky Fried Chicken museum and Restaurant in Corbin, KY. 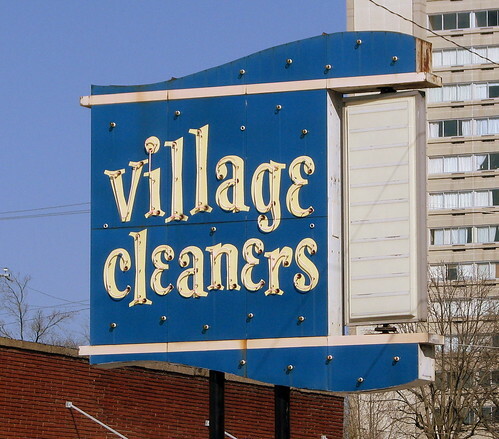 Located in the Hillsboro Village area of Nashville, The little dots on the sign "twinkle" at night. 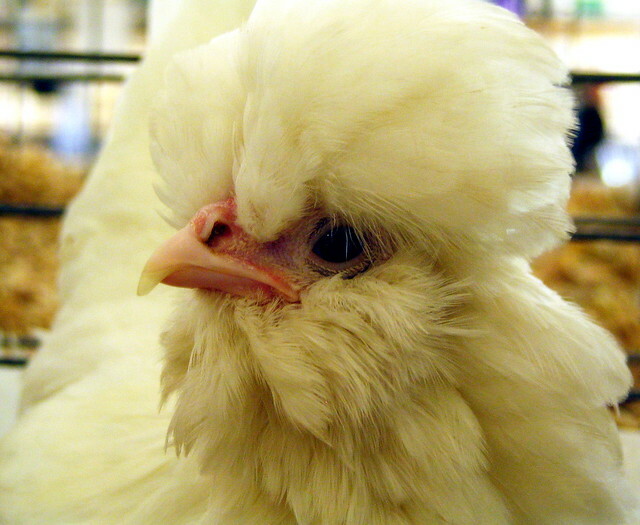 This feathery friend with the proud plumage was seen in the poultry barn at the 2007 Tennessee State fair in Nashville. Birmingham Hide & Tallow Corportate headquarters. 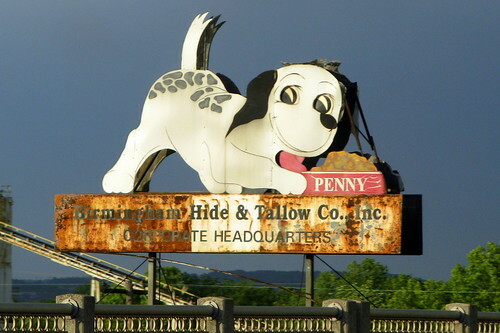 The sign dates back to the 1950s and the tail and eyes used to move. 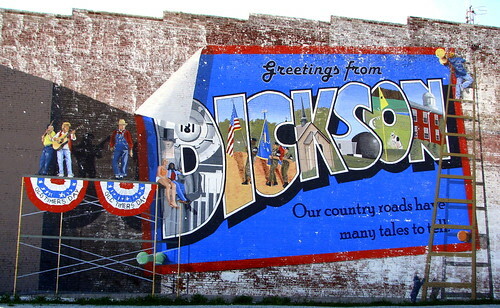 This sign is located along 1st Ave N just east of downtown (also along US11). Located along the town square in Jasper is the old brick train station, although the tracks are long gone. 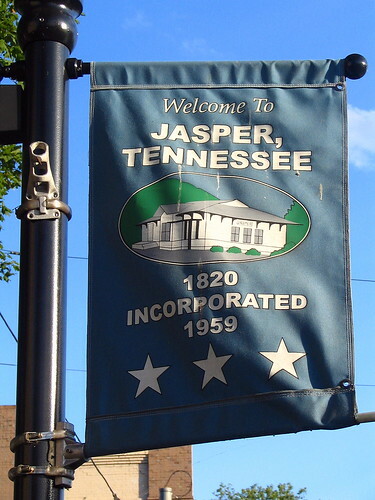 Today the building is preserved and in use as Jasper's City Hall. US41 / 64 / 72 runs past this, as the "Cummings Highway" to Chattanooga stops here. 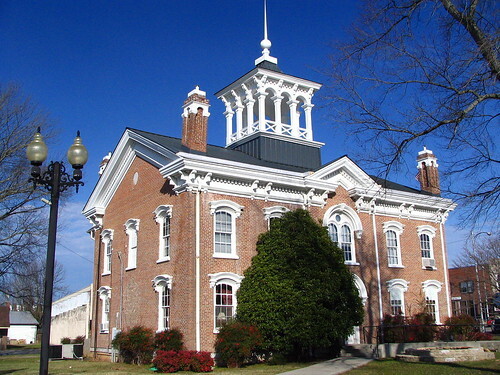 Located in Manchester's town square, this courthouse was finished in 1871. Built in an Italianate style. There was a time when the colors of L&C were changed to represent a weather forecast. 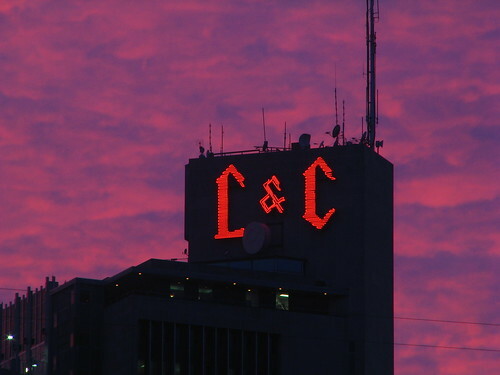 This was back in the days when the L&C tower was the tallest skyscraper in the south. 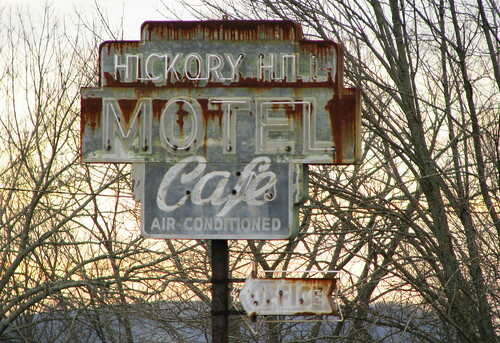 It looks like this place last had a paying customer about the time it was relevant for Motels to mention they had air conditioning. This is on the eastern side of Wilson County, east of Lebanon, TN along the Carthage Highway (U.S. 70N) which has long since been unused by most tourists as it parallels I-40. This barn is along U.S. Highway 11, which connects Birmingham and Chattanooga. This barn is located in DeKalb County about halfway between Collinsville and the Etowah County line. If you want to see a bunch of painted barns, DeKalb County in Alabama is one of the best places to be. There are several for Rock City and Sequoyah Caverns, plus a couple for Ruby Falls. See this location on a map HERE. 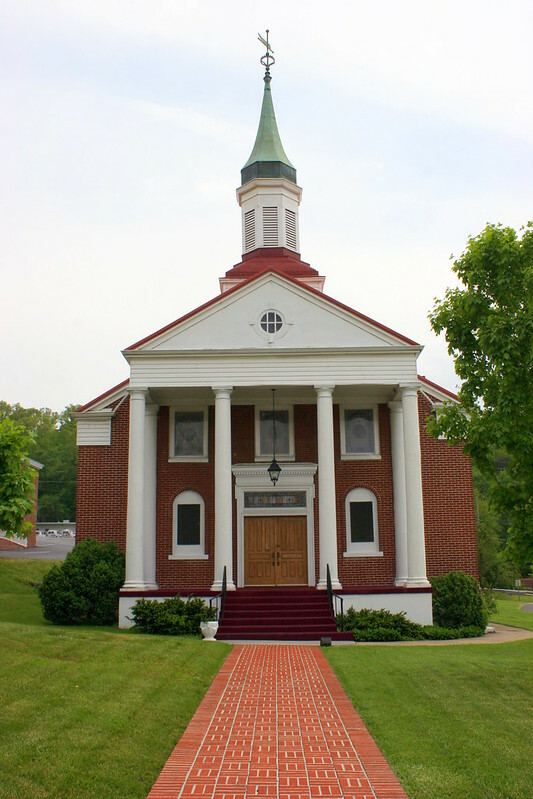 According to a wooden plaque on the gate, this congregation was established in 1820. This Greek Revival building had its cornerstone placed in 1835 and was completed in 1939. This courthouse was completed in 1936, and in my opinion is one of the nicest great depression era courthouses. 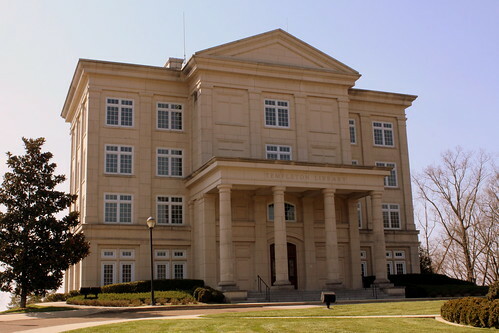 Designed in a Neo-classical style of brick on a stone foundation, the courthouse features two story stone pilasters and corner quoins on the barely taller central section. 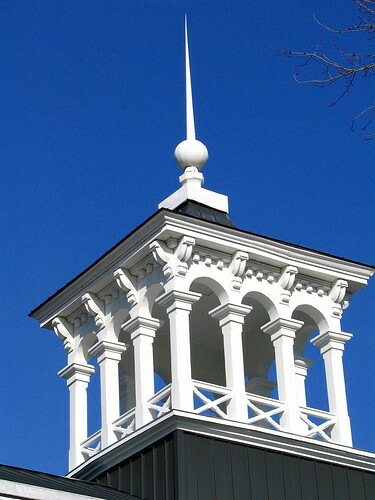 The gable roof is topped by a tall clock tower. 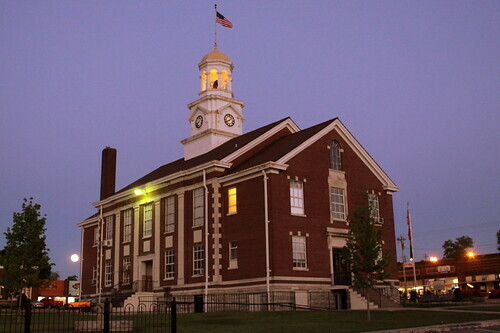 The courthouse replaced an 1838 courthouse, which burned down in 1934 and was also located at the center of the town square. Ocoee Dam No.1 is located a few miles downstream from the famous Ocoee River whitewater rafting area, and this overlook is provided next to a small turnoff along US64/74. It is listed on the National Register of Historic Places. Park's Mill occupied the site of Ocoee No.1 from the mid 19th century until 1910 when the Tennessee Electric Power Company acquired the site for construction of a hydro plant. Ocoee No. 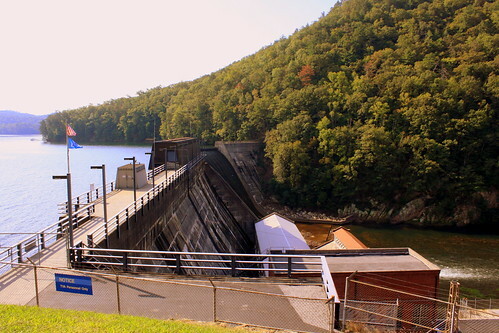 1, Tennessee's first large hydroelectric plant, was the result of efforts by a small group of visionaries who saw the benefits of electric power to the manufacturing industries of the south. Built in just 18 months, in 1912 Ocoee No. 1 began providing electricity for Chattanooga and the surrounding area. In 1939, TVA acquired both Ocoee No.1 and No.2 and electricity generated at the Ocoee plants became part of TVA's growing network of power plants in the Tennessee Valley. The notable thing about this building to me is it's what you see if you're driving from Cowan to Sewanee. There's a long straight drive along US41A right before the ascent up the mountain and the back of this building is at the top of the hill here. This is what it looks like from behind. As it says painted on the side, the hotel opened in 1909 at this location as a railroad hotel near Monterey's train station. 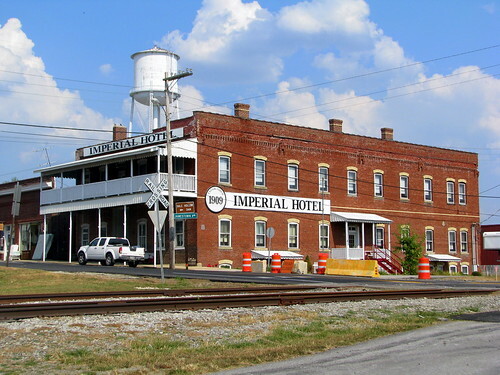 Passenger service stopped in the area several decades ago, so the Imperial stopped operating as a hotel soon after. However, since then, they remained opened as a ballroom and meeting or banquet space. About a year ago in 2012, the Hotel was in the news. With a building this old, it became too costly to continue to meet codes, so it completely closed after a court battle. Also, the stairs and awning on the longer south side was removed to make way for a path to the new Monterey Museum and Depot which is now between the hotel and the tracks. 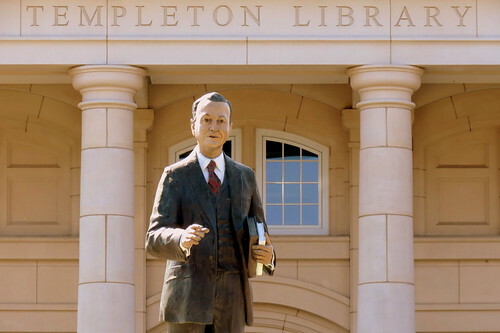 Dr. Joseph A. Bondurant was the original pharmacist, store owner, and designer of the unique building, which was subsequently patented. 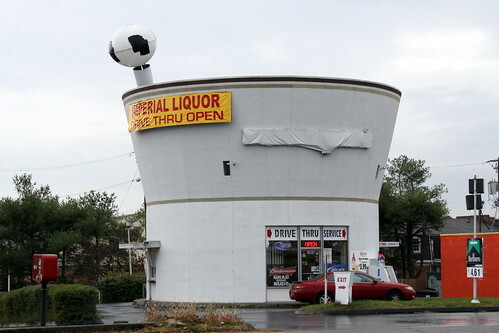 It was also the first drive-thru service of any kind in Lexington. 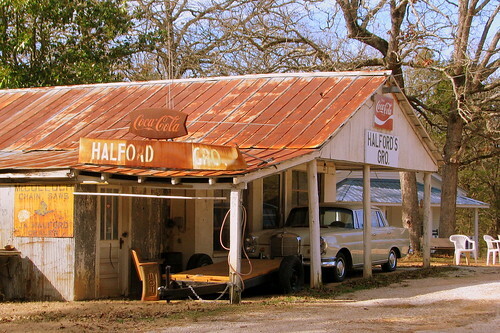 It looks like this was an old fashioned grocery store that recently closed it's business. This is located in Wayne County, along highway TN128 north of Clifton. 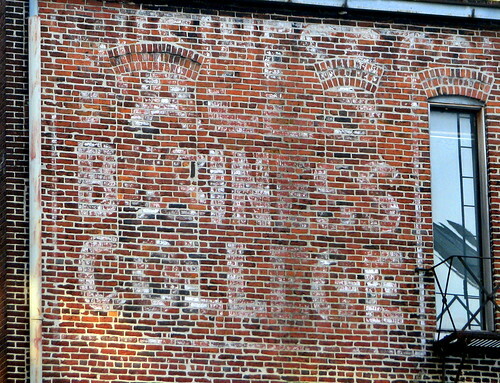 Fall's Business College was a business oriented technical school in the early 70's. I went to school there in 1971 studying computer programming. There was also a computer operations course and a fashion merchandising course. I can't remember the address (it was a long time ago). I was back in Nashville in the early 2000's (I can't remember which year); and I saw that the building was being torn down. It was located in between a homeless shelter, a tire dealer, and a small restaurant. This was a couple of blocks to the right of Church street past the post office downtown. I don't know if it is in business still under Fall's name or if it went under. I attended Falls Business College at the NW corner of 8th and Broadway in May 1956 thru February 1957. Took a general secretarial course, studying typing, English, shorthand, bookkeeping. Had already had these subjects in high school, except bookkeeping. On first floor was Waldrum's Rexall drug store, with a soda fountain and also booths for seating. The business school occupied the second and third floors. No elevator. We entered the stairwell from the Eighth Avenue side, climbed stairs to the school. No air conditioning either. I remember tall floor fans in some classrooms. Soon after I finished school, my husband and I left Nashville for his job, so I don't know what happened to Falls after that time. I suppose that old city directories would tell how long they stayed at 8th and Broad. Do you have any memories you'd like to share? 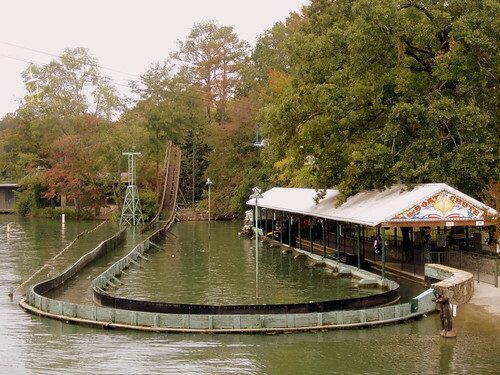 This ride at Lake Winnie reminds me of the old Flume Zoom (or Dulcimer Splash) they had at Opryland or other similar log flume rides at most any theme park. However, this ride was a forerunner to all of those more modern flume rides. Technically, this is a Mill Chute ride and much of the ride is in a tunnel. Being in a tunnel gives you a sense of not knowing what will happen next which was considered thrilling back in the 1920's but today is relatively tame. This ride was the first ride at Lake Winnepesaukah, built by founder Carl Dixon in 1927. According to the National Amusement Park Historical Association, it's the last "Mill Chute Ride" left in the U.S.
TN Highway 68 in Cumberland County leaves Crossville, and a bit later after a hilly, curvy area, the road becomes flat and strait and this barn lines up to your vision. 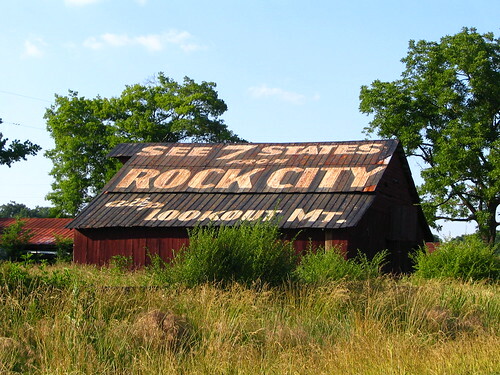 A mile up the road is this Rock City Barn. Highway TN68 continues on to US27, which heads south into Chattanooga. 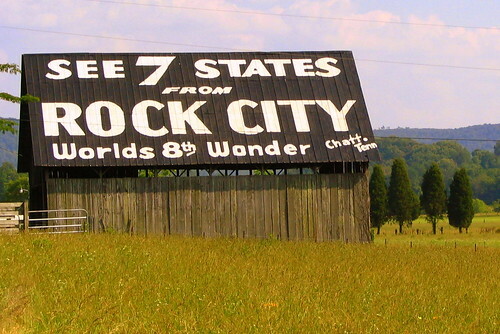 This is one of 81 different Rock City Barns I have photographed and uploaded to Flickr in my Rock City Barns set. People often ask me how I've found so many of them. I have drawn from many resources such as books and web sites and sometimes luck, but there's not really one "go to" place to find them all. Well, now on my website, I have tried to create a one stop source for the locations of all of the barns I've been to. On my Map of Rock City Barns page, I have plotted each barn on a Google Map. 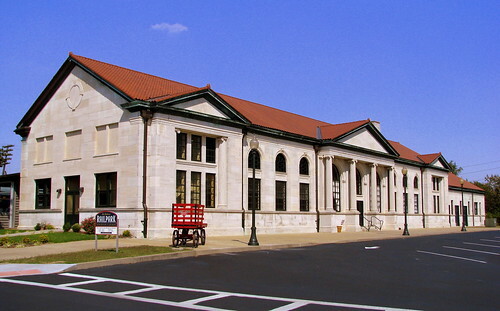 Built in 1923, this building is now a train museum and is on the National Register of Historic Places. 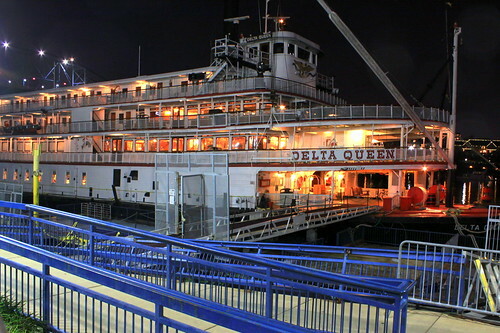 The Delta Queen is a famous steamboat and is a National Historic Landmark which is now docked in Chattanooga, TN serving as a floating Boutique hotel. The Delta Queen steamboat is 285 feet long, 58 feet wide, and can hold 176 passengers. Its two steam engines can produce 2,000 horsepower for a stern-mounted paddlewheel. The Delta Queen dates back to 1926 where it served passengers between San Fransisco and Sacramento. At the time, it and the sister ship Delta King were the most expensive and lavish steamboat ever commissioned. New highways made the steamboats unneeded in California so during World War II it was requisitioned by the U.S. Navy. Since 1948, it has run passenger service along the Mississippi, Ohio, Tennessee and Cumberland Rivers while changing ownership several times. It was listed on the the National Register of Historic Places in 1970 and a National Historic Landmark in 1989. At the end of 2008, all passenger service stopped and was again put up for sale. In Feb. 2009, the steamboat arrived in Chattanooga at Coolidge Park Landing along the Tennessee River across from the downtown area. The Delta Queen hotel officially opened on June 5th of that year. Since then, ownership has changed again, but in the mean time it still operates as a fancy place to spend the night. There's even one room that is said to be haunted by Mary Green, the boat captain in the 40s. 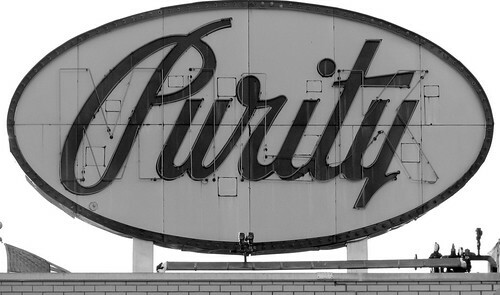 I Haven't been through here at night in a long time so I don't know if they still turn on the neon, but it used to outline Purity and then switch to say MILK. 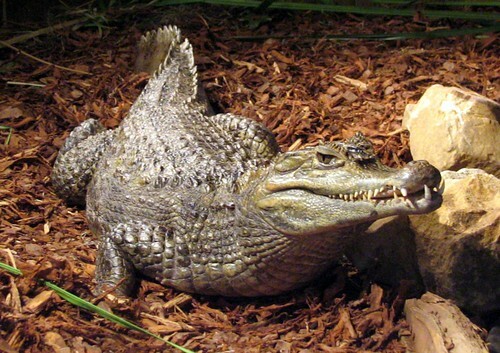 At the Noccalula Falls park in Gadsden, Al is a small zoo, which included this crocodile. He didn't move much, as crocs are prone to do while waiting for food. Gnome Valley is a newer feature at Rock City, seen early along the Enchanted Trail where the white fallow deer used to be. 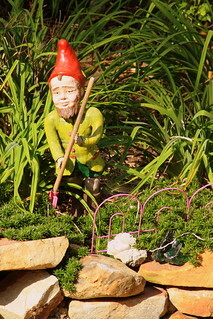 According to their sign, "Rock City Gnomes have long inhabited Lookout Mountain. A number of these rare creatures have recently been spotted migrating into this tiny valley." 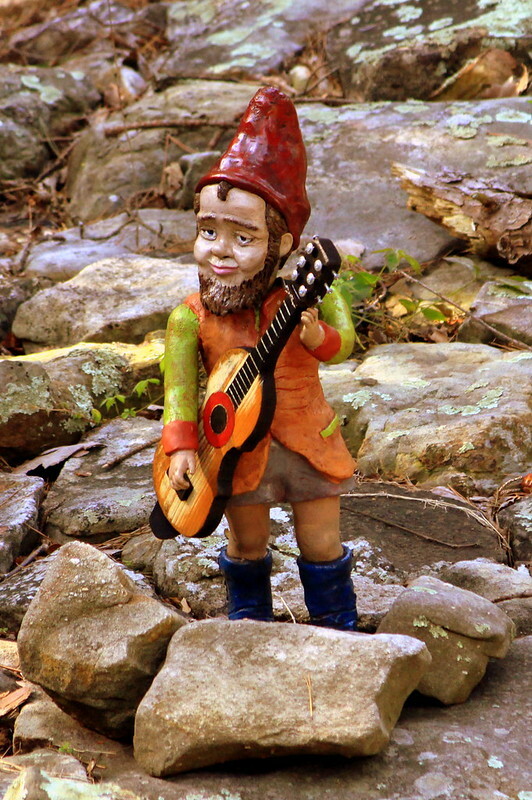 On my website, I have created a gallery entitled "A Tour of Rock City" where I not only have tried to find all of the gnomes, but all the other wondrous scenes at the beloved tourist attraction.